Lindera benzoin is a shrub to 5 m tall; sexes on separate plants (dioecious), all parts aromatic (due to terpenes and other compounds) if bruised, much branched, twigs dark, smooth with pale lenticels, bark smooth, dark; winter flower buds round, small but conspicuous (Harlow 1946). 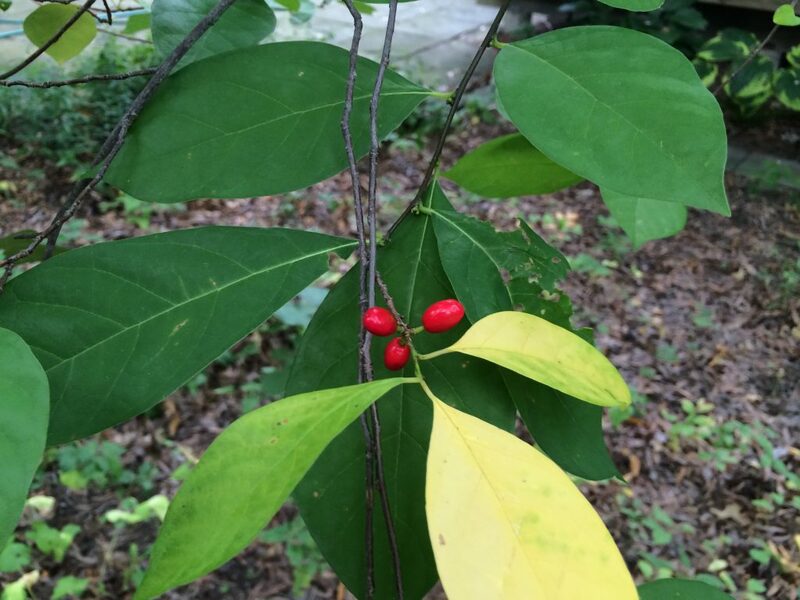 Leaves alternate, stalks to 1 cm long; blade to 12 cm long, pointed at both ends, smooth, untoothed, light green above, pale below; fall color clear yellow, aromatic; leaves expand mid-May; winter plant leafless 172 days (Britton 1874), winter buds small, round, dark yellow-green, flower buds initiated in late summer on current season’s growth, winter buds rounded (Niesenbaum 1993). 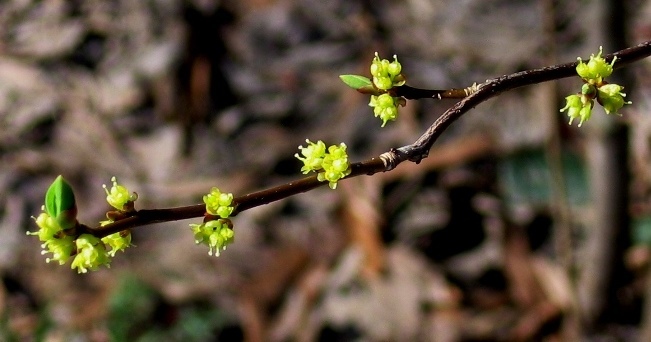 Lindera benzoin flowers.M. B. Gargiullo (2010). Flowers yellow, small to 0.7 cm wide, blooming before leaves appear, early-mid April, in small, dense clusters to 2 cm wide; blooms March-April. Fruit (on female plants) fleshy, red, 1-seeded, with aromatic yellow flesh, ripening as foliage turns yellow Sept.-Oct. Seed load: 38%. Fruit pulp nutrients: water 81%, lipid 35%, protein 12%, CHO 12% (White 1989). High lipid fruit eaten by migrating songbirds, especially woodthrush and veery (Martin et al. 1951). Dispersal to and establishment in new sites in successional forest, contiguous to old regrowth stands has been calculated at a rate of 1.58 m/yr (Matlack 1994). Lindera benzoin (spicebush).© Ben Berry.2014 (Accessed 1/2017). 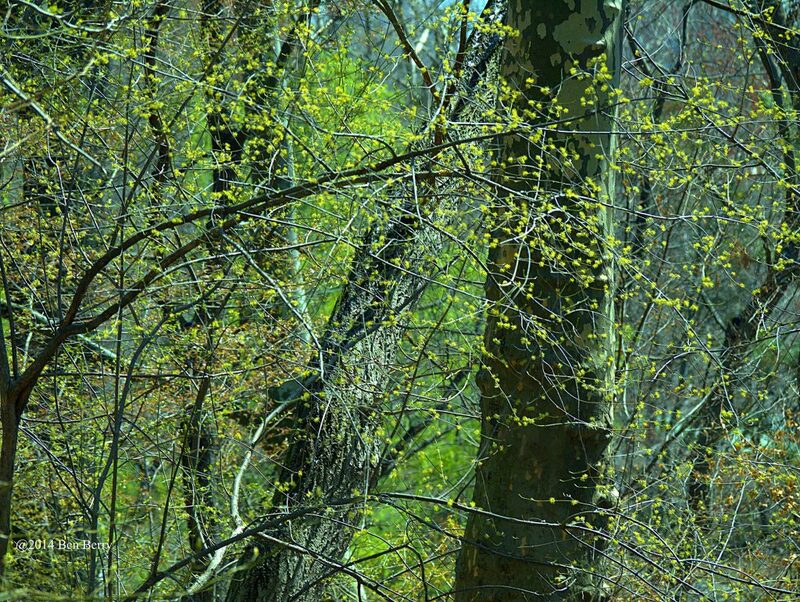 Habitat: Wet to moist understory in undisturbed forests, often forming large stands. Soil pH 4.0-6.5 (Greller et al. 1990; Hightshoe 1988). In NYC found in soils with pH 4.4-7.7 (Gargiullo unpublished data). Moderately tolerant of salt, flooding, saturated soil, up to 25% of growing season. Intolerant of drought, heavy clay soil. Shade tolerant but sets more fruit with increased light levels as in gaps or edges (Niesenbaum 1993; Hightshoe 1988). Notes: Larvae of the spicebush swallowtail butterfly, Papilio trolius (Lepidoptera) and the promethea silk moth, Callosamia promethea eat the leaves and pupate on the leaves and twigs (Covell 1984; Tallamy 2003).